Changing the structure of the category system is not difficult. All codes can be moved with the mouse and the drag-and-drop function. In the following example, the “Code System” contains four codes (C, B, A, and D). To move Code D to the top of the list, you would need to do the following: Click on Code D and drag it in front of Code A while holding down the left mouse button, then, when a line appears, drop the code. It is also easy to make a code a subcode of another code. 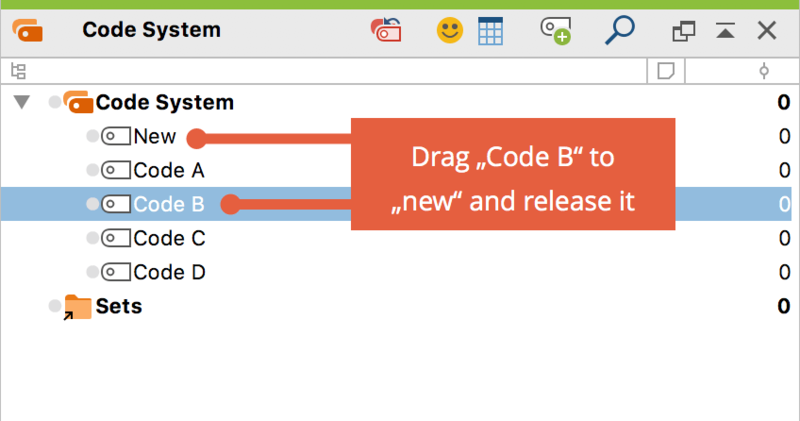 If you want Code B to become a subcode of Code A, for example, you would carry out the following actions: Click on Code B, drag it to Code A, and release as soon as Code A has a green background. Code B is then added as a subcode of Code A. You can select multiple separate codes while holding down the Alt/Option key and then move your selection while holding down the mouse button. To select a range of codes, first click on a code and then click on a second code while holding down the Shift key ⇧. This will then also select all codes between the clicked codes. Subcode can be sorted in ascending and descending order by name and by frequency, by right-clicking the parent code and selecting Sort subcodes from the context menu. Create a new code at the top level of the hierarchy (New Code in the example above). Drag Code B to New Code and release it; it will be inserted as a subcode. Do the same with Code D.
The division of a code into subcodes can obviously not happen automatically because you must decide which references of the code are to be placed in which subcode. You must read each coded segment and decide which of the subcodes is appropriate. In this case, the subcodes will not be exclusive since a person could talk about his father and his mother in the same segment. The easiest option: Click on the information box and drag it to the chosen subcode. Tip: During this process, the segment will be additionally coded with the subcode. However, if you hold down the Strg key (Windows) or option key (Mac) during this process, the code will be moved from the source code to the new code, meaning the top-level code will be deleted. When you click on the infobox, the coded segment will also be selected in the “Document Browser.” It can now be coded as usual, for example using Drag & Drop. This is how you can work with all segments, so you continue in the same manner for the second. When you get to the end of the list, all segments will have been re-classified – they have been assigned to one of the three codes in question. If you used the second method, the old coded segments in the parent code will have been retained, that is, all segments will still be coded under “Family”. However, this is not always useful – the old codes of the parent code usually need to be removed. To do this, you can double-click on the parent code, for example, to list its coded segments in the “Overview of Coded Segments”, select all encodings and then click on the delete symbol in the toolbar. Right-click on the Childhood code and select Copy subcodes. Right-click on each of the other main codes and select Paste subcodes. MAXQDA then adds the copied sub-codes in the same order as the original code. The newly inserted sub-codes keep the Color previously assigned to them.